Cypressa Halloumi Cheese, which originates from Cyprus, is ideal for use in a variety of recipes. The creamy-tasting, chewy-textured cheese lends itself to barbecuing, frying or grilling, and when heated the exterior hardens while the interior melts. Cypressa Halloumi is made from cow's, goat's and ewe's milk with a hint of mint and is delicious eaten as it is, or cubed with salads and fruit. Toss the aubergine and olive oil together and fry in a large non-stick frying pan over a medium heat for 15-20 minutes until tender and light brown. If the aubergine starts to burn reduce the heat. Allow to cool for 5 minutes. Lightly crush the chick peas in a bowl with a potato masher then mix in the lemon flesh and juice, garlic, tahini and mint. Add the aubergine to the mixture and stir well. Divide the herb salad leaves between 4 plates and top with the chick pea salad. Heat a ridged griddle pan over a medium high heat and dry fry the halloumi for 1½-2 minutes on each side or until golden. 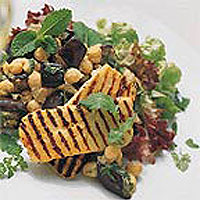 Top the chick pea salad with the cooked halloumi and serve immediately, garnished with mint sprigs. The chick pea salad can be made a few hours in advance and is best served at room temperature, not chilled. If you make the salad in advance, assemble it with the leaves just before serving.